As LIMF unveil one of the festival’s special commissions, Getintothis’ Josh Ray has the lowdown on a four-part event that will explore the special musical relationship between Liverpool and New York. As a port city, Liverpool’s culture is informed by a range of influences from across the world but, besides Ireland, it is probably fair to say the USA had the most profound effect on the city’s collective consciousness. After the second world war took the stride out of Liverpool’s step, the new ideas, technology and culture emanating from the USA added colour to the increasingly monochrome existence at the time. The two biggest sources for these revelatory discoveries were airbases like RAF Burtonwood just outside Warrington – whose US GIs brought new ideas and music to Liverpool – and perhaps more significantly, a group who came to be known as the ‘Cunard Yanks’. Working on the trans-Atlantic Cunard cruise-liners, this group of working class lads – now afforded a middle-class salary and international freedoms – immediately stood out when they returned to Liverpool and heavily influenced the musical and cultural development that would go on to put the city on the map. Tracing these roots from the post-war period through to the nineties, Liverpool: Next Stop New York will celebrate the music that helped forge a unique bond between the two cities in an entirely free, four-part LIMF extravaganza. As a prelude to the later events, running from August 6 through to the end of the month will be an exhibition at the View Two Gallery on Mathew Street. Investigating the links between Liverpool and New York and how they were enhanced by a love and appreciation of Black American music and culture, the RedHouse Originals-curated gallery and exhibition will feature an array of works from artists and photographers with links to both cities. As well as an exclusively commissioned sculpture by Mike Badger of The La’s and original paintings by Horace Panter of The Specials, the exhibition will also feature work by acclaimed artists, Dudley Edwards, Pete McKee, Low Coney and The Studio of Ezra. Alongside the exhibition, a range of archive photography will be displayed to shine more light on the fascinating post-war period. With contributions from original Cunard Yanks themselves and selections from the archives of the Liverpool Echo, National Museums Liverpool and the International Slavery Museum, there’s plenty to draw from when building a picture of the era. Tracing the future development of Liverpool’s culture, the exhibition will also feature shots of L8 from Tricia’s Porter’s recent exhibition at the Bluecoat, unseen photographs of Earthbeat taken by Roger Sinek, images from Mark McNulty and Steve Howe’s personal collection and a series of eight exclusively commissioned portraits by Liverpool-based photographer Robin Clewley, featuring some of key contributors to the Liverpool: Next Stop New York project. The exhibition will remain on display at the View Two Gallery until August 31. 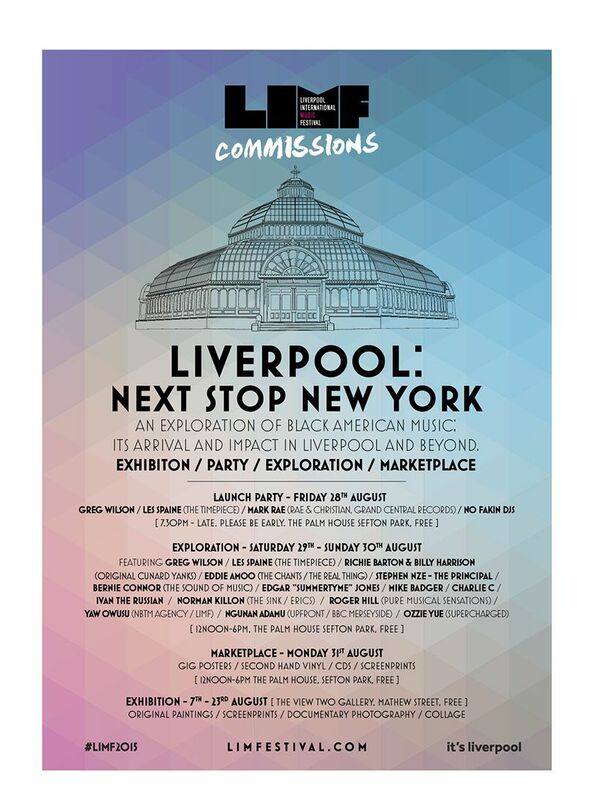 The highlight of the four events promises to be a free Next Stop New York Party in Sefton Park‘s Palm House on the evening of Friday August 28. The first-come-first-served event will be a celebration of the original-era DJs, Greg Wilson and Les Spaine, who first brought revolutionary American sounds to Manchester and Liverpool in the late 1970s and early 1980s. Alongside the two legends will be modern purveyors of American-influenced music, Manchester’s Mark Rae and Liverpool’s hip hop collective No Fakin’. This event will be sure to fill up quickly so make sure you head down early if you want to take in the fun and the iconic music that defined several generations. Having established himself in New Brighton, Greg Wilson began working at Manchester’s Legend, taking the cutting edge sounds coming over from New York and introducing them to a British audience in the late seventies and early eighties, both establishing the electro-funk/boogie scene in the city and playing an essential role in the UK’s adoption of mixing – the tradition of announcing records was still ingrained in the culture at the time. On the back of his success at Legend he was hired as the first dance music specialist at the later legendary Haçienda in 1983. Born in Sierra Leone and brought up in Liverpool, Les Spaine made his mark on UK club culture in the seventies during his time at The Timepiece. Contrary to the belief that all Northern DJs played Northern Soul, DJs like Les spearheaded Liverpool’s defiant move against the grain, playing funk and soul records from the likes of Marvin Gaye and Kool & The Gang. Held in high regard by those in the know, Les went on to work for both Motown and Capitol Records after his time at Liverpool’s infamous funk and soul club. 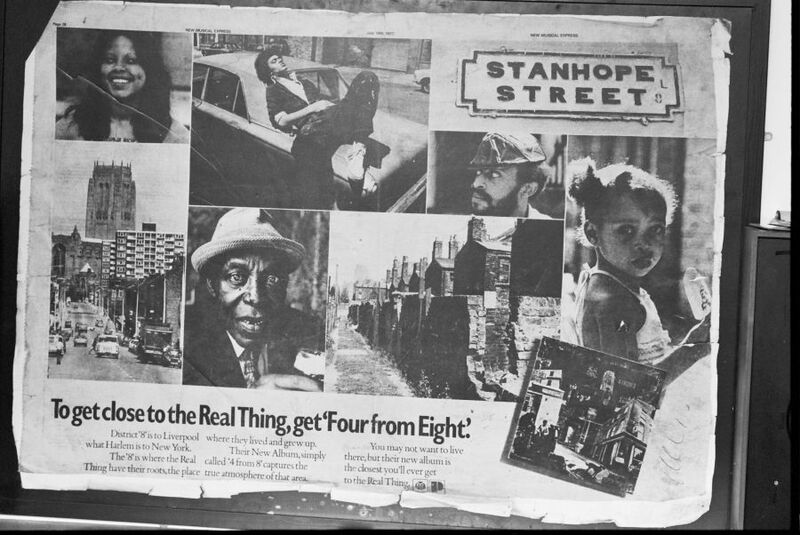 A key figure in Manchester’s funk and soul underbelly in the nineties, Mark Rae’s Grand Central Records harnessed the soul-driven hip-hop sound coming out of the city at the time, combining it with the best he could find further afield. Bridging the gap between jazz, funk, reggae, hip-hop, breakbeat and jungle, his DJ sets draw from a whole history of Black American and British music as well as his back-catalogue of work created with his production partner as Rae & Christian. Deep-rooted in the city’s hip hop culture, having pushed it forward since the late ninties, No Fakin’ are a Liverpool hip hop collective born out of a night of the same name. Made up of Kwinzola and DJ Illson, they use four turntables, blending and layering their way through a kaleidoscopic array of music anchored in hip-hop, creating a semi-live show with live instruments, samplers, drum-machines and more. Be sure not to over-indulge at the party of the night before as, spread over the weekend of August 29-30, will be Exploration, a series range of Q&A sessions, discussions, and panels with music, of course, playing a prominent part. Covering a range of topics relating to Liverpool’s connection with US black music and culture, the interactive talks will bring together a range of knowledgeable people able to draw from their own first hand experience. Part of the original group working on the Cunard ships, Richie Barton and Billy Harrison will lead The Cunard Yanks talks exploring the influence the trans-Atlantic cruise-liner had on the city. From The Chants to The Real Thing will feature Eddie Amoo, famed for his work with both bands in the 1960s and 70s, and Ozzie Yue, who went on from his Merseybeat fame with The Hideaways to become a familiar face on British television. Talks on The Influence of Radio will be hosted by presenter of BBC Radio Merseyside’s Sunday evening Upfront Show, Ngunan Adamu alongside the local DJ with an encyclopaedic knowledge of the city, Bernie Connor and DJ 2Kind who presents Friday night’s StreetBeats Show on Wirral Radio. Renowned local selectors Stephen ‘The Principal’ Nze and Ivan ‘The Russian’ Freeman will be exploring The History of Social Clubs and Soundsystems in L8 in talks that will segue into a discussion around the Earthbeat movement of the late eighties and early nineties with Jonathan Swaine, the visual artist involved with the guerrilla group of community activists and artists. On top of this, The Role of the Club DJ in Liverpool will be discussed by Norman Killen and Greg Wilson – the former at the vanguard of the Liverpool scene, pushing the boundaries at The Sink, the latter a central figure in the development of the modern DJ in the UK as the first person to mix two records together on British TV. With yet more names still to be announced Exploration certainly seems like an event to mark down in your calendar. To round things off on Bank Holiday Monday, Liverpool: Next Stop New York will turn Sefton Park‘s Palm House into a Marketplace. Boasting a treasure trove of vinyl from some of the region’s premier retailers and record labels, as well as hard-to-find screen-prints and posters, the event will be soundtracked by a range of DJs covering music from the period of exploration. For more information on the four-part extravaganza, check out the official website. For more on the rest of the festival check out the LIMF website.